Husband of Elizabeth Maness and Arrenia Ritter. 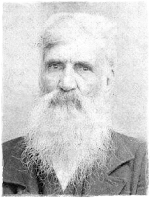 Son of Lewis Garner and Elizabeth Yow. Husband of Elizabeth Yow and Rebecca Yow. Son of Bradley Garner and Barbara Andrews. Frank was the son of Dempsey Cagle and Elizabeth Burroughs. Maggie was the daughter of Levi Williams and Mary Garner. Image of Private Matthew C. Yow of Company D, Forty-Eighth Regiment N.C. Troops. Yow is wearing a waist-length jacket and holding a book, which rests on a cloth-covered side table. It is likely that the same photographer captured this image and the one of Private Cornelius A. Stutts of the same unit (see frontispiece). Both poses and backgrounds are similar, and both soldiers are wearing the same type of uniform. Image supplied by Mrs. Thomas J. Cumby of Mount Airy, North Carolina. "Ambrotype of Private Cornelius A. Stutts of Coompany D, Forty-Eighth Regiment N.C. Troops. Faintly appearing in the painted background are a large tree and a house with a multi-gabled roof. When the ambrotype glass is reversed, the same tree appears over the shoulder of the image of Matthew C. Yow of the same company. (see photograph following page 363). Scratched into the surface of the ambrotype are the remains of Private Stutt's name and initials and (what appears to be) the date 1895. The fingerprint in the upper right-hand corner is probably the photographer's. Ambrotype supplied by Fred McLeod of Dudley, North Carolina".